The Oaxaca beaches are world-famous, they are spoken of in lists and rankings alongside the best beaches in Thailand, the Caribbean and the South Pacific. On the Oaxacan coast, life goes by slowly and beauty is everywhere. The combination of jungle, mountains and spectacular beaches create some of the most amazing landscapes of Mexico. Huatulco, Puerto Escondido, and Mazunte are some of the destinations that have become very popular among surfers and tourists, but what else is there yet to discover in Oaxaca? Very much. Many of the most impressive areas of the Oaxaca beaches are rather unknown to most tourists and are preserved in a pristine state. The landscape on this Oaxaca beach seems to have come from a dream: golden dunes, green hills, and the Pacific Ocean. Because it is off the radar of tourists, it is practically desert for most of the year. Near Huatulco, La Bocana is a popular beach but it retains its virgin quality. There, it is practically you and the great landscape of rocky mountains and thick vegetation. A photogenic corner of Oaxaca that will steal your heart. Black sand, nature and little else. Mermejita looks like almost all the beaches in Oaxaca before the arrival of tourists. Do not miss the opportunity to explore it while it remains that way. A small and charming bay hidden among mountains. Most of the people who arrive are because they received the recommendation of someone in Puerto Angel, but it is still one of the most secret and virgin beaches in Oaxaca. A fishing village where the Southern Highlands of Oaxaca meet the ocean to create one of the most spectacular natural settings in the state. Also, stay for dinner with the locals, the best fresh fish, and seafood. If what you are looking for is peace, silence, and stillness, this is the place for you. This little paradise on the west coast of Oaxaca is one of the quietest and least known beaches in the state. The best part of this place is the amazing sunsets. It will be hard to believe that this place exists and you have never heard of it – it is one of the most spectacular beaches, not only of Oaxaca but of Mexico. This pair of twin bays has everything you want on a beach: silky sand, crystal blue waters and a pleasant natural landscape. Did we mention that there is nothing around? Of course, there are some very popular Oaxaca beaches as well. These beaches may attract more tourists, but they are worth a visit as some of the best beaches in Oaxaca. Start with the most famous of the region, in this multicolored paradise for the rich underwater life and the diverse flora and fauna between sea and mountain, you will live one of your best vacations because the environment is unique and fun is assured. Huatulco is the place of pirates, archaeological sites, miscegenation, customs and traditions that today show one of the most important tourist destinations in Mexico, with a beautiful hotel zone in Tangolunda Bay, aquatic and recreational activities, tours and a nightlife that does not stop. You can not miss the town of La Crucecita in Santa Cruz Bay, with restaurants and small hotels, cheaper than in the hotel zone, highly recommended if you are looking for a more local experience. If you want to get away from the hustle and bustle of the city, this place is a great option because its tranquility is imminent. It is a beautiful landscape composed of mountains that protect beautiful beaches of fine sand and varied waves, a small fishing pier and is ideal for diving and observing flora and fauna. Puerto Angel is between the bays of Huatulco and Puerto Escondido in Oaxaca, in an idyllic atmosphere for a stay or vacation at your own pace. Located 53 km from Huatulco. 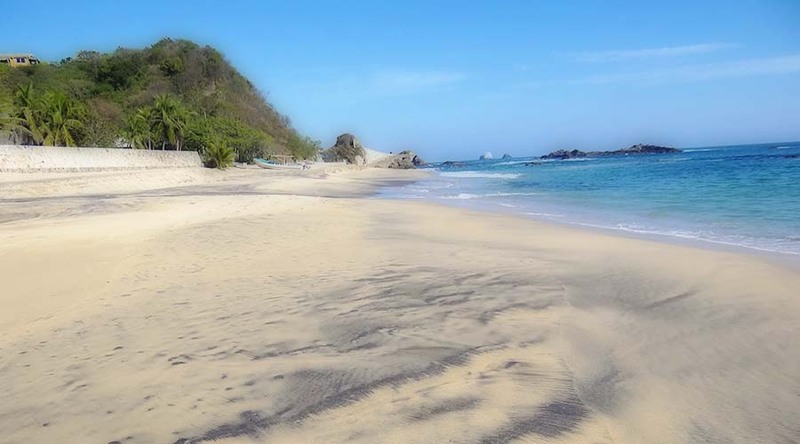 Another of the cherries on the cake is Zipolite on the Oaxacan coast, a strip of beach 2.5 km long that sometimes feels trapped in time, it is a nudist beach that continues to be one of the most sought-after sites over the last decade. The 60’s by hippies and today by all kinds of travelers in search of calm and peace at sea, very busy primarily by foreigners. It is a beach of soft golden sand, suitable for surfing, diving and boat rides. Located to the east on the Oaxacan coast, 3 km west of Puerto Angel, Zipolite is a quiet place where you can also do snorkeling and with some luck, dolphin and whale watching. There is a Yoga Center for classes, seminars, and courses, which is enjoyed facing the sea. Nearby is San Agustinillo beach, with moderate to strong waves and restaurants with typical and delicious dishes. The coast of Oaxaca has a lot to give. One of the most relaxed and beautiful places at the foot of the sea in Mexico, is undoubtedly Mazunte, a kilometer of golden sand with temperate and crystalline waters of green and blue tones, with memorable attractions such as: Punta Estrella, the sacred hill of ceremonies with privileged geography, excellent to appreciate sunrises and sunsets, as well as for migratory birds and marine mammals such as whales; the Mexican Center of the Turtle, a place for the preservation of this species that arrives here to spawn each year. This is one of the most famous and visited tourist sites on the Oaxacan coast. Embellished by capricious rock formations, it is a magnificent destination for surfing and nightlife, but also to admire the flora and fauna of the place that will leave you in awe, because through a boat ride you can see pelicans, hawks up close, hummingbirds and other waterfowl that predominate in the lagoon of Manialtepec. In the surroundings, there are communities to know and live an experience closer to their lifestyle and customs. It is 113 km from Huatulco. A whimsical natural site of 14,187 hectares, five lagoons of fresh and salt water, with a wonderful coast with two beaches: Chacahua and Cerro Hermoso. It is a protected natural area, a sanctuary area for the marine turtle (olive ridley and leatherback) where more than 150,000 are born annually and where there is also a crocodile farm in danger of extinction. As you can see, Oaxaca beaches are a privilege to be enjoyed during a vacation in Mexico, an Eden on the beach, with the kindness of its hosts, the rich and colorful cuisine, its craftsmanship of clay in its different colors, markets full of life and color and of course its coast, with each one of its treasures! Welcome to the Oaxaca beaches!